Saudi Arabia could be bankrupt in a matter of years. The global rout of oil prices is taking its toll on the country's bottom line. The government has cut spending in its upcoming Budget and considered selling shares in Aramco, the state-run oil company. The kingdom's oil minister said Tuesday that producers may meet in March on an output freeze, but that crude production will not be cut. Saudi Arabia, Russia, Qatar and Venezuela proposed last week a production freeze at January levels in response to the global glut and sustained low prices of crude. Epic Research recommends Crude oil trading range for the day is 3200-3336. 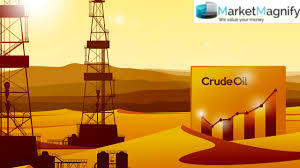 For more live crude trading tips anyone can join our company and get awesome knowledge. We are leading stock & investment advisory Company. Deals with Stock, Stock advisory tips, equity, commodity tips. Accurate Information is a key part of motivation ! !